There are two types of people in the world: the ones that allow themselves to be defined by past experiences, and those who use their hardships as a way to strengthen themselves and rise above. In Amy Hatvany’s latest novel, Somewhere Out There, we see both types, as two sisters who were torn apart when they were young are reunited as adults. When Jennifer got pregnant as a teenager, against her mother’s wishes, she decided to move in with her boyfriend and keep the baby. Little did she know that he would kick her out. That she would become homeless. That she would have a second child. And that she would end up in prison. For shoplifting food at a grocery store. For her children. Natalie Clark never knew her birth mother. She was too young to remember her. She didn’t even know that she was adopted until she had to do a family tree project for school. 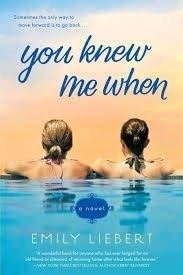 Now that her own daughter has to do the same, Natalie musters the strength to ask her parents the questions she was always too afraid of, finding out that she has a sister that she never knew existed. Natalie feels betrayed by her parents’ actions and immediately goes about trying to find her long lost sister. The last time Brooke Walker saw her mother or little sister, she was four years old. She moved from one foster home to the next, eventually growing up in a state facility, while her baby sister was adopted. Brooke lives in a small studio and works as a waitress. She doesn’t have any friends, and seems to only date emotionally unavailable men. Brooke never lets anyone get close to her. She keeps herself at a distance from everyone that she comes in contact with, preferring to feel nothing than to get hurt. She blames her mother abandoning her and her sister for never trying to find her. When Brooke and Natalie finally reunite, Brooke is cautious and keeps her distance. Even when she starts to let her guard down, she isn’t able to completely open up and trust her sister. Natalie wants answers to why their mother abandoned them, but Brooke is hesitant. After digging, Natalie finds out more than she could have imagined, leaving herself heartbroken for both the little girl that she had been and for the pain that her mother – Jennifer – had gone through. Natalie and Brooke eventually meet Jennifer, but are their relationships ones that can be repaired? There were many moments in the novel that I found myself in tears…mostly for the chapters with Jennifer. Yes, her children went through a lot, having lost their mother and each other, but what Jennifer had to deal with was truly heartbreaking. How do you come back from a loss like that? Sometimes you don’t. Sometimes, even if you want to, even if it is presented to you, it’s not enough. Natalie was able to use her losses as strength, something that Brooke has a hard time doing. But what about Jennifer? Will she be able to find a way to let her daughters back into her life, or will it break her?